Bahroop came into existence in 1996 when a group of people from different walks of life decided to share their experience with a larger section of the society. Its productions Kale Kauwe Ne Kaha, Dekh Tamasha Dekh, Baghichha Bachharam Ka, Zaharqand, Soopna Ka Sapna, Aur Kitne Hiroshima, Yahan Se Shahar Ko Dekho,B-Three, Hamare Waqt Mein, Saaye Hamsaaye, Woh Bhi Thei Apne and Panahgaah were awarded byDelhi Urdu Academy, Government Of NCT of Delhi in 1997, 1999, 2001, 2003, 2004, 2005, 2006, 2007, 2008, 2009, 2010 and 2011 respectively. Its play Soopna Ka Sapna was staged in 5th Bharat Rang Mahotsav. Bahroop participated in various festivals like Bahoorupi organized by Rangayana, Govt. of Karnataka and Shiv Sanchara National Theatre Festival, Sanehilli, Karnataka. Other successful productions have been Kath Jogi, Madhvi, Toot-Te-Parivesh, Banailey, Reech Gaan, Thank You Mr. Glad, Bada Bhand To Bada Bhand, Nahi Chahiye Hamen..., Kabira Khada Bajar Mein, Men Without Shadows, 1857, Jangal Ke Daawedaar and Cheezein Toot Rahi Hain.Bahroop's Ghair Zaroori Log, 8/6, Yahan Se Shahar Ko Dekho, Spartacus and The Life of Galileo were selected as one of the best plays of Delhi for the year 2001-02, 2003-04, 2004-05, 2005-06, and 2007-08 by Sahitya Kala Parishad,Government Of NCT of Delhi. Bahroop has also organised talks, seminars and workshops with eminent personalities like Habib Tanvir, J.N. Kaushal, G.P. Deshpande, Satish Anand, D.R.Ankur, Vinit Kumar, Chittaranjan Tripathi, Shrikant Kishore, Piyush Mishra, KS Rajendran, Suman Kumar, HS Shiva Prakash and Mushtaq Kak. It publishes a theatre magazine, Bahroop Theatre Digest. Based on the famous novel ‘Raag Darbaari’ by Shrilal Shukla, Ranganath Ki Waapsi is an intellectual kaleidoscope viewing and reviewing the world in our proximity. It deliberately dodges cynicism despite an in-depth scrutiny of fundamentalism, racial and class profiling, parochialism, chauvinism and political apathy amidst all other menaces of a forced urbanization of an indigenous setting. 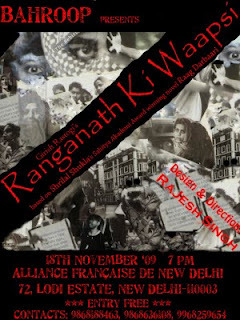 The play highlights the failing values present in post-Independence Indian society. It exposes the helplessness of intellectuals in the face of a strong and corrupt nexus between criminals, businessmen, police and politicians through a suave and hilarious satire. This ‘Shivpal ganj’ is the microcosm, as a mirror reflecting the macrocosm -the whole of India and the world. Bhopal Gas Tragedy: to put things into perspective. © copyright: Bahroop Arts Group, 2013. courtesy:. Picture Window theme. Powered by Blogger.